In our little mountain town of more than 87,000 people, Bend has a startling abundance of world-class breweries clustered close together like the gold at the end of a big, beer rainbow. Bend has more breweries per-capita than any other city in Oregon and has been dubbed Beer Town USA! If beer isn’t your thing, that’s okay. Bend’s growing selection of distilleries and wineries are a great way to quench your thirst for adult beverages, so make sure you check out the Drinkable Diversions along the Bend Ale Trail while you’re in town. As you forge your way along the Bend Ale Trail , whip out your passport (one required per person) and ask for a stamp at each brewery. No purchase is necessary at any of the brewery stops, though it’s a great chance to sample suds everywhere you go. Please refer to each brewery’s hours of operation here, as not all of them are open 7 days a week. Got stamps from 10 breweries? Awesome! Pat yourself on the back, then stop by or send your completed passport to the Bend Visitor Center (please note Bend Visitor Center hours of operation) to receive your souvenir, a commemorative Bend Silipint! 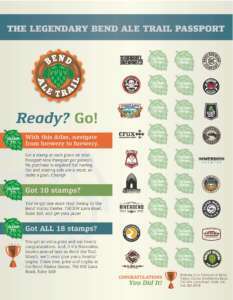 Got stamps from all 18 breweries? Rock on with your bad self! Not only do you get the Silipint, we’ll also give you a nifty Bend Ale Trail bottle opener. It’s important to keep in mind, too that you don’t overdo it. No purchase is necessary to complete the Ale Trail, all you’ve got to do is stamp your passport at each location. It’s probably not wise to attempt the entire Bend Ale Trail in one day. Luckily Bend is home to many great hotels & motels, resorts, vacation rentals, and even B&Bs. Find your perfect place to rest up along the Bend Ale Trail on our Where to Stay page. Where do I pick up my Bend Ale Trail map & passport? Pick up the Official Bend Ale Trail atlas at the kiosk in the participating breweries, at the Bend Visitor Center in downtown Bend, the ticket mill at the Old Mill District, or any Central Oregon brochure rack. You can also print a copy of just the passport by clicking below. Pick a designated driver. The designated driver is someone who is not drinking ANY alochol for that entire day and is responsible for transporting his/her group safely along the Bend Ale Trail. Use the passport to collect your special “Designated Driver” stamps. you will need to declare yourself as the designated driver to the brewery staff to get this stamp. Collect a minimum of 10 DD stamps from the Bend Ale Trail brewery locations and redeem your passport at the Bend Visitor Center for your unique Designated Driver prize. Your passport must only have DD stamps on it in order to claim your prize. There are also no shortage of safe and knowledgeable tour operators who are here to make your experience just that much better. They’ll set you up in style in a cushy bus, a snazzy towncar, or even a Cycle Pub. If you’d prefer to hoof it, start from downtown Bend where more than two-thirds of the breweries are within walking distance. For more Visit Like a Local tips, click here. You can be a Bend Ale Trail champion by completing the Bend Ale Trail during the official Bend Ale Trail month every November. Earn extra prizes, plus enjoy plenty of beer inspired events happening around town.